So we did it again! We made another Dutch Baby because we loved making them last time! We decided this time to add fresh Raspberries this time, and than drizzle our new Raspberry Syrup on top! It was superb! Add just a dollop of homemade whipped cream and this is going to be your new favorite brunch item! Evenly sprinkle dried raspberries over the butter; set skillet aside. 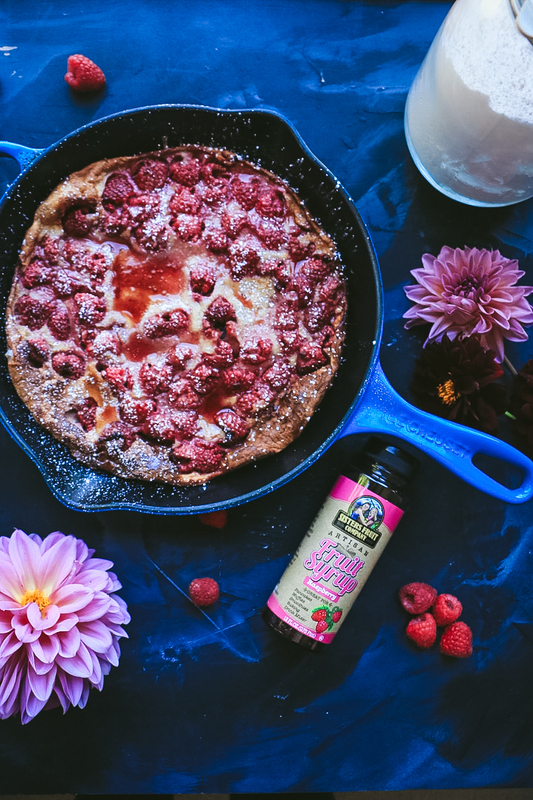 Allow Dutch baby to cool in skillet momentarily before optionally dusting with confectioners’ sugar and drizzling the Raspberry Syrup on Top. Carefully slice and serve. Add a dollop of homemade whipped cream. Dutch baby is best fresh, but extra may be stored airtight in the refrigerator for up to 4 days.